Snow Sky makes all under Pat Smullen to give Sir Michael Stoute another win in the Hardwicke Stakes. Snow Sky, at 12/1, provided a shock result as he made all the running for a clear-cut victory, with his Sir Michael Stoute stablemate Telescope, the 6/4 favourite, sixth of the seven runners. 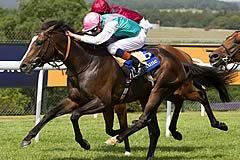 "That was a surprise," said Stoute, winning the Group Two mile-and-a-half contest for the ninth time, "but a nice one. After he won the Yorkshire Cup last month he looked like a Cup horse and we thought we might be going to Melbourne with him. Now we might have to have a rethink, but it's not a bad problem to have. "This is the best race he's run by some way and he surprised me by the turn of foot he showed off the bend, that was where he won his race and he was impressive. We've never had him in front before but there was nothing obviously going to go on, and we couldn't let that happen, and we knew he stayed. He's really grown up, and is much more mature now, and is a clean-limbed, good-actioned horse, which is what you want." 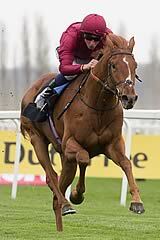 Snow Sky, a Nayef four-year-old owned and bred by Khalid Abdullah, was Stoute's first winner of a week. He is, though, Royal Ascot's leading current trainer and Snow Sky brought his overall total to 73. "We were due a change of luck," he said. "I'm just glad to get a single before the week is over." Telescope was disappointing, but Stoute put his display down to the firm ground. "He's run on it before, but maybe this time it just caught up with him," he said. "He's run two good races already this season and I'm sure he'll bounce back." Snow Sky may be back at Ascot for a step up to Group One level the QIPCO King George VI & Queen Elizabeth Stakes next month, for which he will have to be supplemented. ""I was chuffed to bits," said Khalid Abdullah's racing manager Teddy Grimthorpe. "We were talking to Pat [Smullen, rider] beforehand and I said "Prince Khalid will never sack any jockey that makes all, I can tell you that" so we said jump and be happy. "He got into a great rhythm, then began to stretch them a little bit and then, even better, he quickened off the turn and really won the race from there. We sort of had sort of slightly longer plans for him but I think the King George has to come into it now. The way he has won today and he has beaten these good horses. It was a pretty exceptional performance." Eagle Top finished second to runaway winner Snow Sky, with Postponed in third, but the trainers of the placed horses had different reasons for voicing their concerns about the way the race was run. John Gosden, the trainer of Eagle Top, who was ridden by Frankie Dettori, voiced barely-disguised criticism of another jockey, believed to be Postponed's rider Adam Kirby, after the two horses had raced closely together throughout the race. Eagle Top was held in by Postponed in the home straight - albeit perfectly legally - before Dettori was able to pull his mount back and get a clear run that took him into second place. Clearly unhappy, Gosden said: "I've always felt that when a jockey is paid to ride a horse, they should ride their own horse. Unfortunately, a certain jockey spent the whole of the race riding our horse, which we hadn't employed him to do. I have nothing else to say on the matter, but I hate to see unnecessarily messy races, with one jockey all over another horse. It's not clean racing and it's not intelligent. "I'm delighted with the horse [Eagle Top] and I'm hoping to come back here for the King George, next month." Fellow Newmarket trainer Luca Cumani, who saddled Postponed, spoke to journalists before Gosden had made his comment, and said: "It was a strange race [due to the slow early pace] to put it mildly, and you would have thought a horse that wants a mile and six furlongs [the winner Snow Sky] would have been most unsuited by it, but he turns out to be the most suited. "In the circumstances, our horse ran well and I look forward to a rematch when there is a proper pace. They went slow and then sprinted, but he tried hard. The King George is likely [to be his next target]." Snow Sky does not currently an entry in Ascot's big mid-summer race.